Discover why the media, big tech and the globalist elites have banned J.K Sheindlin from social media. Learn the truth about the most depraved human recorded in history. 'Questions that Islam can't answer' is the latest book series from the #1 international bestselling author J.K Sheindlin. Guaranteed to silence any advocate of Islam, this book is the perfect companion to Sheindlin's first bestseller, 'The People vs Muhammad - Psychological Analysis'. "Read with great interest and was very impressed by the level of research committed to the project." "J.K Sheindlin has done something incredible!" J.K Sheindlin has spent over 10 years decoding the Islamic texts and analysing the founder of Islam - Muhammad. Through painstaking and intensive studies, the author has exposed the rotten core of the faith by using simple logic and certified psychological archives. 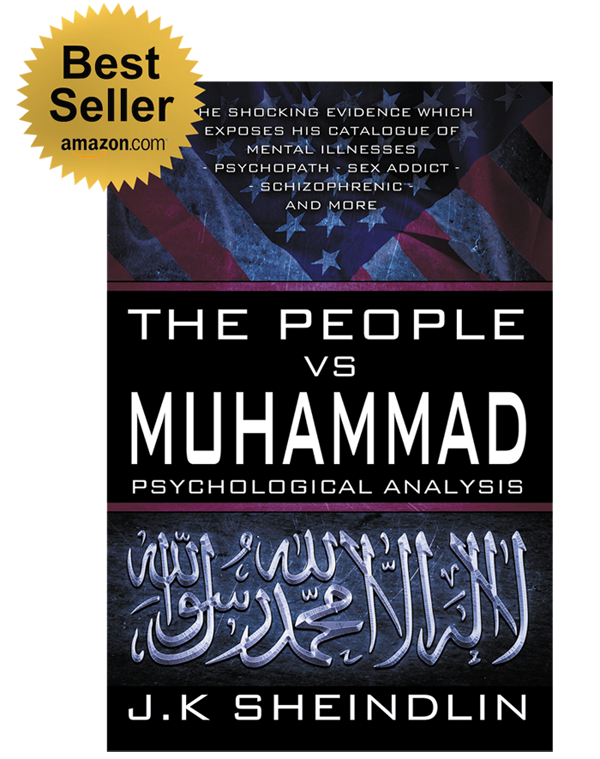 Critically acclaimed by reviewers worldwide,'The People vs Muhammad - Psychological Analysis' has remained irrefutable and unchallenged by Muslims who have read the book. Author, journalist and now documentarian, J.K Sheindlin is working tirelessly with a team of researchers to expose Islam. Did you know that the author has been shut down on almost every social media network? Since the release of 'The People vs Muhammad - Psychological Analysis', Sheindlin has been systematically targeted by the media, Facebook, Twitter and Google for simply speaking the truth! ​And now, Youtube has shut down J.K Sheindlin's channel NBT Zone after it reached over 71,000,000 views and 95,000 subscribers! Likewise, Amazon consistently removes customer reviews of Sheindlin's books for no reason. Equally so, Barnes and Noble was also caught deleting reviews of Sheindlin's books which praised the author's work and spoke the truth. ​Sheindlin faces rampant persecution for exposing the evil ideology which threatens to overthrow our democracy and sovereignties. The author also continues to receive death threats daily from Muslims. We need your help to spread the word! We can no longer use Facebook as their communities department actively censors our posts and shuts down our account without warning. "A friend encouraged me to read this. I was at the end of my seat for the first time reading a book. An absolute must read. Especially in today's climate." "Don't believe your parents propositions; know for yourself who you serve - Good research and eloquently presented to the reader. A must read book for all; no more hiding behind Islamophobia." Sheindlin has been targeted for censorship by all social media platforms, especially Facebook where the author has been permanently banned without reason. ​J.K Sheindlin is the author of the #1 international bestseller 'The People vs Muhammad - Psychological Analysis'. The book has reached over 71 million viewers through Sheindlin's affiliate Youtube company NBT Zone. In 2017, The Canadian CFLA proposed a permanent national ban on the book, deeming it "too dangerous for all ages." Since its release, Sheindlin has been permanently banned from Youtube, Facebook and is actively censored on Twitter. There's no surprise, as the majority of western corporations outsource to Muslim countries. 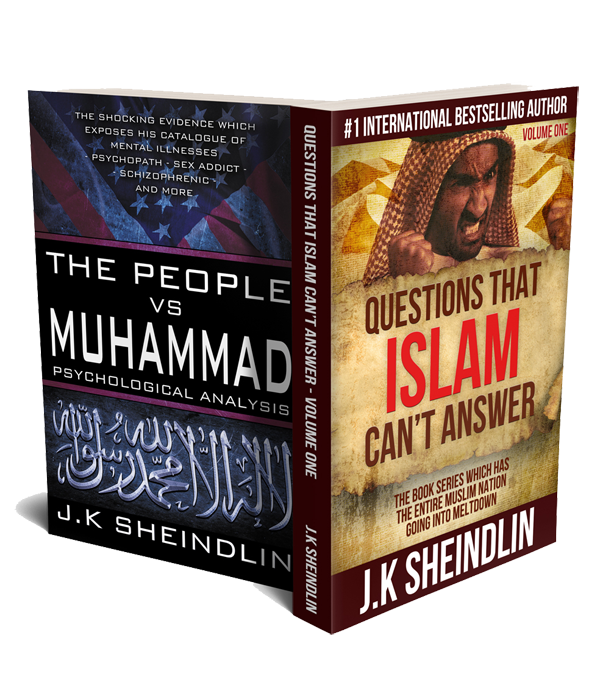 J.K Sheindlin's books remain on international bestseller lists, joining the ranks among highly reputable authors such as Sean Hannity, Newt Gingrich, Glenn Beck, Sam Harris, Christopher Hitchens, Richard Dawkins, Ayaan Hirsi, Robert Spencer and even the Dalai Lama. Despite being actively shunned by the media due to the book’s highly controversial content, demand for more copies have been phenomenal regardless of the constant resistance to expose Muhammad. Since its publication, the reaction has been a doubled edged sword. J.K Sheindlin has for some time received insurmountable pressure from the politically correct to be silenced for the sake of false peace. This has lead to an atmosphere which encourages death threats from Muslims, of which J.K has received plenty. However, the light at the end of the tunnel are the testimonies of those who have left the faith because of the book. For those who have openly penned a letter to Sheindlin to express their gratitude for the book, J.K is truly appreciative and humbled. Their journey into a future replete of freedom and choice is not only due to the book, but truth itself. After gaining 71 million views on Youtube, the social media giants have shut down J.K Sheindlin. ​Find out how they broke their own rules to silence the truth and keep Muslims in the dark. Discover the truth about what the globalist elites have been keeping secret. Order your copy today and be prepared to open your mind.